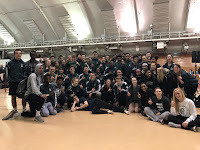 The Madison Memorial track & field team returned to Lussier Stadium Wednesday night to compete in the JV and Frosh City Championships hosted by Madison LaFollette. The nice weather stuck around for another night and the jv and frosh kids showed their appreciation by performing at a high level. It is always fun to see our team compete at this meet and look for those athletes who will be competing on the varsity team on the near future. We encourage the athletes who competed tonight to dedicate themselves to make the big next step to improve their PRs and become varsity level athletes. Some of this work will happen in the coming days, much of this work will happen over the summer and in the off season. Which city champions from tonight can score points at the varsity meet next year? Who else will be able to help our team take the next step to be City Varsity Champions? At tonight's meet athletes who placed in the top 5 of their event scored points for the team. Team places were kept track of in both JV and frosh competitions. On the girls side the JV team finished in 3rd place with 42 points, LaFollette scored 86 points and in the Frosh competition the girls scored 62 points to finish in 2nd place behind West's 83 points. On the boys side the JV team scored 93 points to take 1st place outdistancing LaFollette who had 75 points and the Frosh scored 87 points also taking 1st place outdistancing West who scored 62 points. Congratulations to the boys team on their JV & Frosh City Team Championships!! Frankie F in the JV 100m dash (13.9), Joan M in the Fr 400m dash (1:09.9), Freshman 4x100m relay, Katie H in the Fr 300m hurdles (1:01.0), Kyra H in the Fr 3200m run (13:18.8), and Lindsey K in the JV 3200m run (14:11.1). Their were some field event champions but we don't have complete results yet...we will update when we get them. JV 4x800 relay (9:20.6), Fr 4x800 relay (9:53.08), Trevis M in the JV 100m dash (11.5), Fr 4x100m relay (52.1), Calvin J in the Fr 800m run (2:18.0), and Zach H in the Fr 3200m run (11:25.6). Also, field event champions will be added once complete results are available. Make a goal, set your sights high, and work hard to reach these goals. This is how JV and Frosh competitors become varsity competitors in the future. We have many athletes who competed Tuesday night for varsity that were in this same place of the jv and frosh athletes just a year or two ago. Lots of work in the weight room, multiple miles on the road, and plenty of speed & agility drills have transformed these athletes. Take the next step! Interested in running some more track meets?? Check this out! !